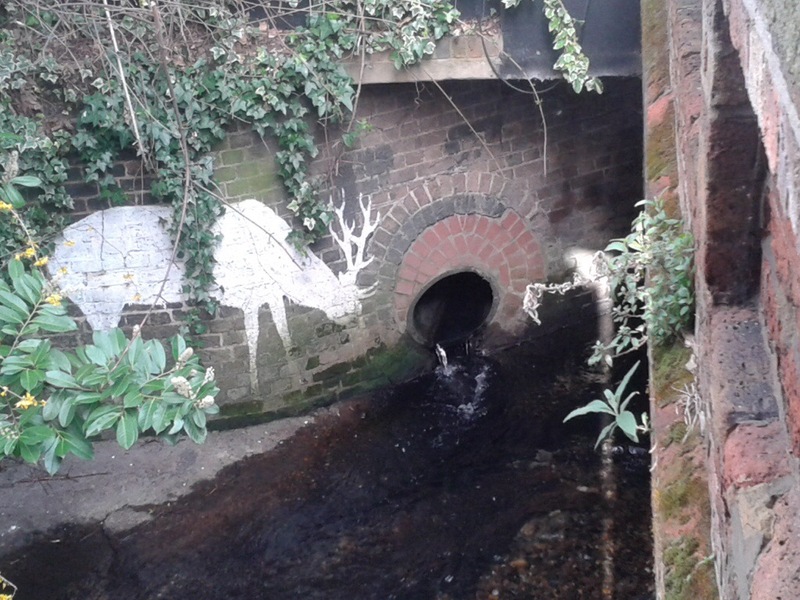 We left the Quaggy close to Lee Green with a Lewisham Natureman stag ‘grazing’ by the outflow of Mid Kid Brook, before that Running Past has followed the Quaggy from its sources around Locksbottom; then on through Petts Wood, the Hawkwood Estate, Chislehurst and Bickley, through the golf courses of Sundridge Park and on to Chinbrook Meadows; through the concrete and countryside of Mottingham; and latterly through the playing fields and parkland of Sutcliffe Park and the Lee/Blackheath borders. The river changes here; gone now are the almost bucolic feel of the river through the playing fields and parkland in the section of the river from Sutcliffe Park to Lee Green. The Quaggy is now very much an urban river, with building up to the banks and the route downstream for the fluvial flâneur often parallel with the river only visible on bridges. Riverside pubs have been conspicuous by their absence so far, but are a much more regular feature as we follow the last mile or so of the course. The Old Tiger’s Head, 50 metres or so away from the river, was the base for the mid 1840s horse racing of the Lee Races. Lee Green was still rural then, complete with a green, a windmill and a farm – Lee Green Farm. 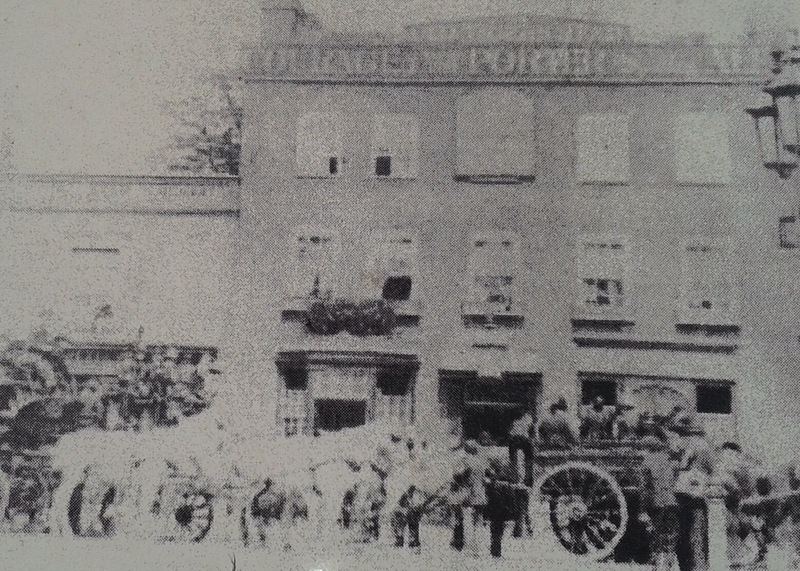 The pub was very different then, being rebuilt in the 1890s, as the picture above from an information board at Lee Green shows. The Quaggy squeezes between some 1990s flats and a plot of land that was Victorian housing and will presumably be returned to housing again; it was latterly the showroom of Penfolds Vauxhall dealers, after they moved from the former Lee Picture Palace on the corner of Bankwell Road. The river, for a short period, is again banked and bedded in concrete – little is able to grow but that didn’t stop a few optimistic sticklebacks from attempting to eke out an existence in a hostile environment (below, top left) when I did the research for the post. The river forms the rear boundary between homes in Lampmead and Brightfield Roads – the former named after a field. The course wasn’t always thus, the Quaggy originally took a course further to the north touching the southern end of what is now Lenham Road. 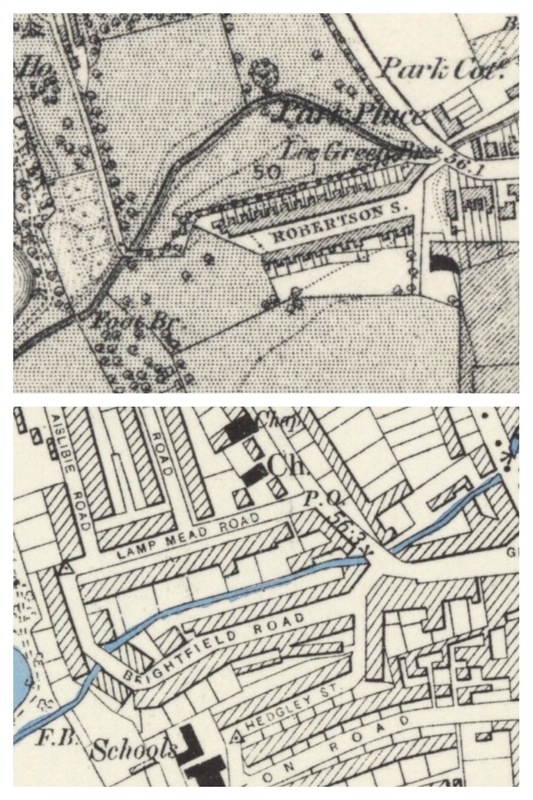 The differences are clear between the 1863 (top map below) and 1893 visits of the Ordnance Survey Cartographers (maps on a Creative Commons via National Library of Scotland). 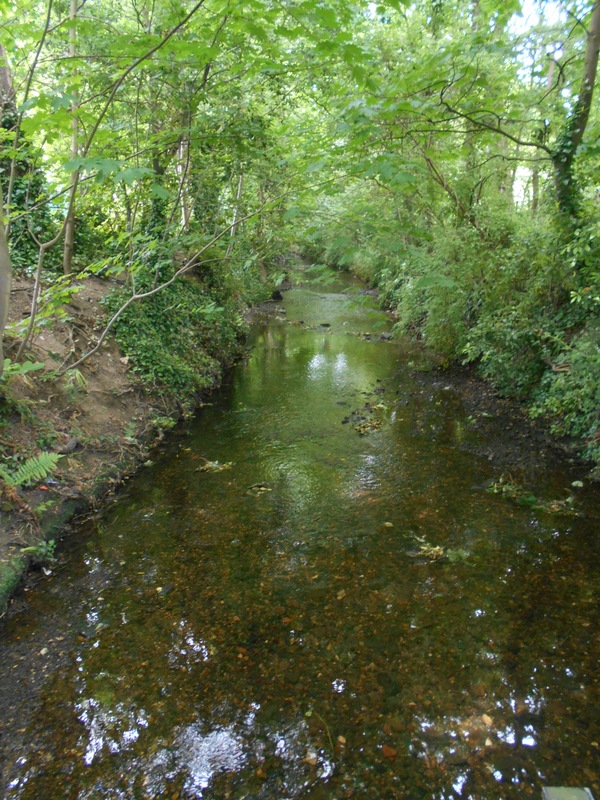 The effective development of Lampmead required the straightening of the river, following what was previously a path behind the houses of Robertson Street, which was to become Brightfield Road at around the same time. The curved building (above, top right and bottom) hugs the banks of the river. The Quaggy is bridged by the dog-leg of Brightfield Road before tumbling down into Manor House Gardens. 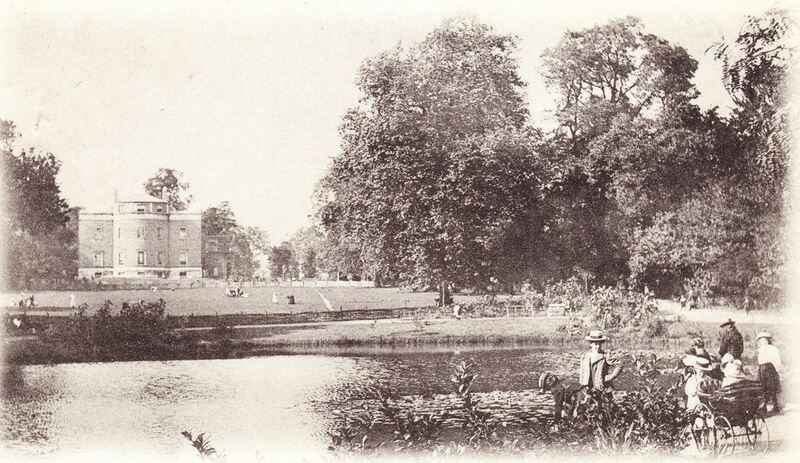 The Gardens are one of Lewisham’s flagship parks and were the grounds to a large house built and maintained from the proceeds of slavery until bought by the London County Council as a library and park in 1902. The Quaggy seems to have originally fed the small lake although is now at a much lower level. It is bridged a couple of times within the park, both having been the venues for generations of Pooh Sticks, no doubt played before the game was named in the 1920s by A A Milne. The river has natural earth banks topped with a dense tree canopy throughout its 400 metres or so through the park, during the summer the river is heavily shaded. The steep banks make the river relatively inaccessible through the park. 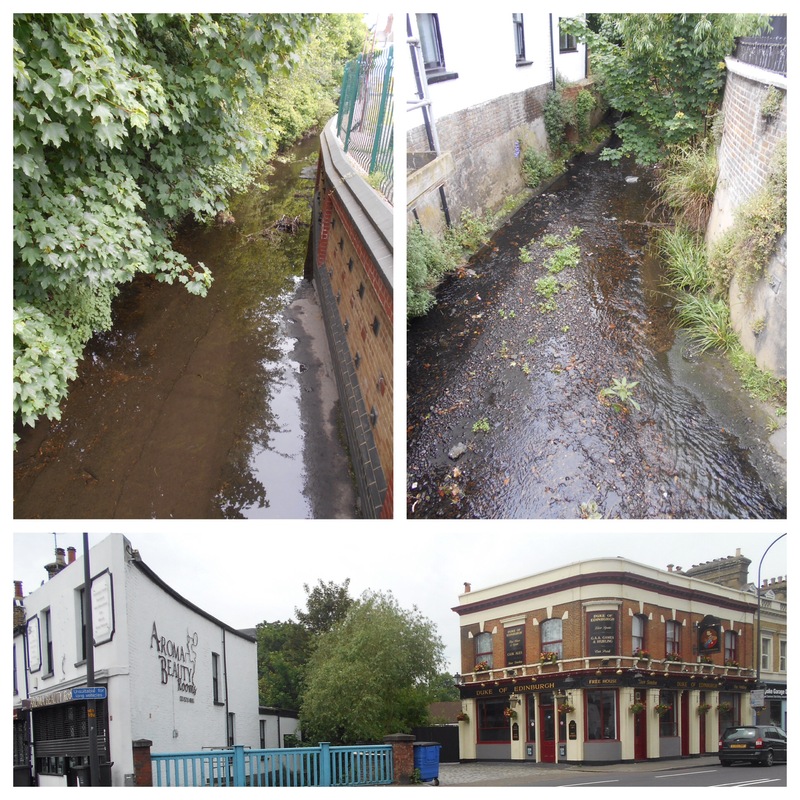 Flowing out of Manor House Gardens, the river crosses Manor Lane, an old farm track and again forms a boundary – between the WJ Scudamore homes of Thornwood Road, a Lewisham Council sheltered scheme off Manor Lane and later more Scudamore homes on Manor Park. 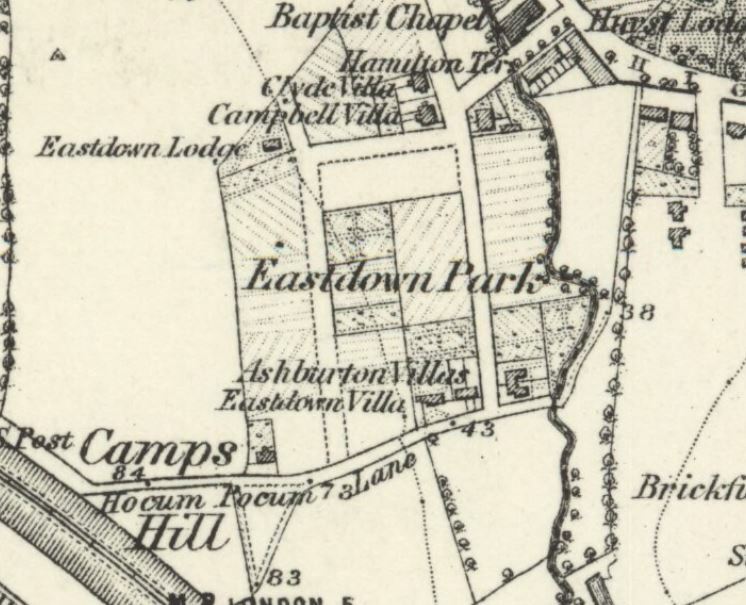 This was a largely rural area until Hither Green station was build in the 1890s, there was a junction there from the 1860s, as the 1870 map below on a Creative Commons from the National Library of Scotland) shows. This part of Lee was still used for market gardening, mainly run from Manor Farm, until the Scudamores built homes of what was marketed as the Manor Park Estate..
Over the other side of Manor Park the river turns almost 90 degrees, to flow between more gardens, between Manor Park and Longhurst Road, briefly visible by peering around a bridge on one side of Staplehurst Road – close to the shops posted about earlier in 2017. 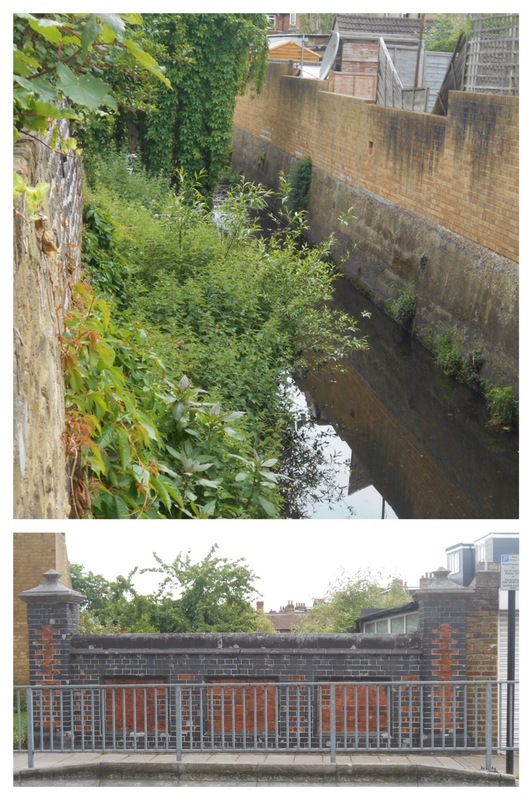 Just before the bridge the river is joined by one of its tributaries, Hither Green Ditch (Quaggy Hither Green). The river continues northwards, squeezing between the gardens of Manor Park (the street) and the northern end of Longhurst Road before opening out into Manor Park (the park rather than the street). The park’s rejuvenation has been covered before in Running Past, the former small pig farm has gone from one of Lewisham’s worst bits of open space to one of its best. The Park has become a community hub – centred around the Arts Cafe. 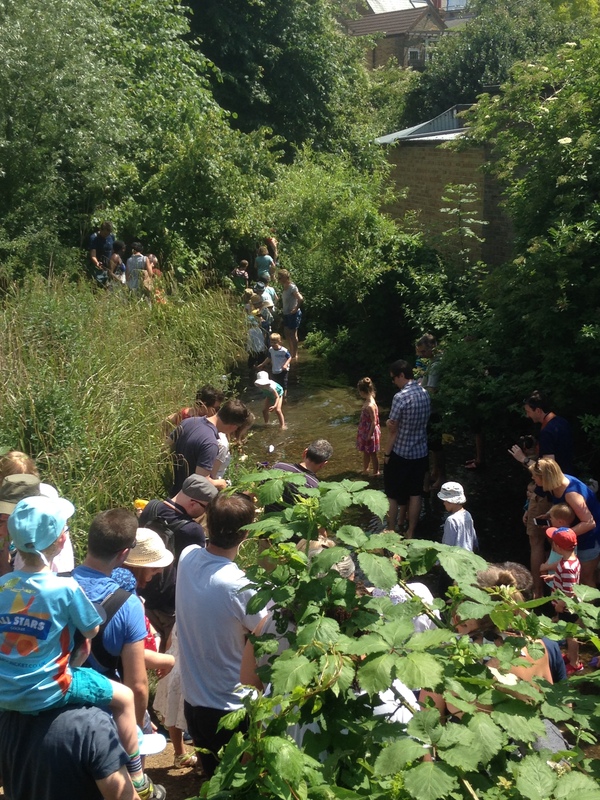 The river itself is used much more – including the annual Quaggy Duck Race and the Float Your Boats event in June 2017, pictured below. At the edge of the Park, there is a bridge – while the structure is a new one, the crossing an old one – it was the final section of Hocum Pocum Lane – an ancient path from Lee High Road to St Mary’s Church, and possibly beyond. We’ll leave the Quaggy here for its final section to its confluence with the Ravensbourne in Lewisham. This entry was posted in Uncategorized and tagged Brightfield Road, Duke of Edinburgh, Lampmead Raod, Lee Green, Lee Manor House, Manor House Gardens, Manor Park, Quaggy, Tiger's Head, W J Scudamore on July 5, 2017 by Paul B.
Charles Morton, the landlord of the Tiger’s Head always seemed to be on the look-out for sporting events, particularly those that involved gambling, that might bring in customers. The blog has covered distance running, sprinting and hurdling and horse racing before. So it is of no great surprise that live pigeon shooting, common in Victorian Britain, was tried out at the Tiger’s Head over the winters of 1843 and 1844. It was a sport that had a ‘not quite respectable’ reputation – there were sometimes reports of those operating the traps being bribed to pull out the tail feathers from an opponent’s bird to make it fly erratically and hence be much harder to shoot. 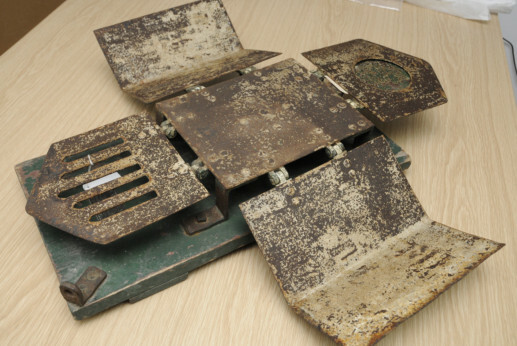 The picture below is of the sort of ‘trap’ that was probably used – this one is in the Ryedale Folk Museum – several would be lined up in a row. They would have a lever connected to a rope at the side – once ready the shooter would shout ‘pull’, the rope was pulled and the pigeons escaped into a hail of shot. In February 1843, ‘The Era’ noted ‘A goodly muster of shooters attended at Morton’s, the Tiger’s Head, Lee Green, where several sweepstakes and matches were excellently contested’ (1). The second reported shoot was the following year, although sadly for Moreton, poor weather seems to have restricted the turnout for the meeting during the second week in January 1844 (2). Two weeks later another shooting match was advertised for up to 10 people with 10 shilling entrance fee, 7 pigeons each, for a silver cup prize (3). In the end only 6 participated, including an appropriately named Mr Bang – the cup being won by a Mr Luffman (4). There were no reports in subsequent years of pigeon shooting at the Tiger’s Head, while the poor turnout amongst the competitors may have had a bearing on this, the changing neighbourhood with the area around Lee Green with new housing being developed on Lee Road and Lee Park was probably as significant a factor though. Horse racing, the Lee Races which the blog covered a while ago, met a similar fate during 1844 too. Moreton though had troubles of his own which may have distracted him from his business – his father, also a publican working then in Blackfriars, had got into serious debt after an employee stole from him and he took his life in 1844. The inquest was at the Tiger’s Head. The Era (London, England), Sunday, February 19, 1843; Issue 230. The Era (London, England), Sunday, 14 January, 1844; Issue 277. Photo of the (Old) Tiger’s Head in its original incarnation is from the information board by the Leegate Centre at Lee Green. This entry was posted in Lewisham History and tagged Lee Green, Pigeon shooting, Tiger's Head on January 6, 2016 by Paul B. A few weeks ago, in a post on the Greenwich Cowboy, distance running at the (Old) Tiger’s Head at Lee Green was covered in passing. The landlord there in the early 1840s, Charles Moreton, tried a number of different sports to try to get additional drinkers into the pub, offering prizes and, no doubt, facilitating gambling on the outcomes. Some of these other sports will be returned to in later posts. One of the events that were tried out was sprinting – both on the flat and over hurdles. The first recorded one was in August 1844. It was advertised as a ‘foot hurdle race’ over 12 equidistantly placed hurdles on a 350 yard course – presumably along what is now Eltham Road (the longer distance races run by the Greenwich Cowboy and others were that direction). In horse racing terms this first race would be described as a ‘maiden stakes’ as it was only open to men who had never won a hurdle race before. The prize was a silver cup (1) but there would have undoubtedly been some side bets on the outcome. The race was reported in The Era, a newspaper that covered sports and theatre that was published between 1838 and 1939 – after a number of heats the final was between Railway Jack and Makepeace – who clipped the penultimate hurdle and fell leaving Railway Jack the winner (2). Several of the sprinters also competed on the ‘flat’ over a 140 yard course in October 1844. The ‘A’ race for 5 sovereigns was between Edward Smith and Wild, ‘Merrylegs’, the latter who raced at a variety of distances, ‘won in gallant style’. The evening’s ‘B’ race saw Mitchell beat John Perch (Railway Jack) over the same distance for 2 sovereigns (4). Sprinting on the streets, mirrors one of the more recent developments in athletics – taking sprinting into temporary tracks and ‘stadia’ in city centres – such as the Manchester City Games and its counterpart in Newcastle, the Great North City Games, a precursor to the following day’s Great North Run half marathon. 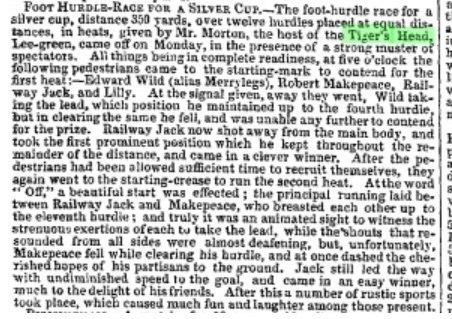 This entry was posted in Lewisham History, Sporting & Aviation Pioneers and tagged Tiger's Head on July 22, 2015 by Paul B.
Tom Cook was one of the journeyman professionals of the running branch of pedestrianism in the 1840s. Other than his nickname, ‘Greenwich Cowboy’ and the tales of his races, little is known about him. There was a Thomas Cook from Norfolk who lived in East Greenwich in the 1851 census who would fall roughly in the right age group but his ‘trade’ was different, so it may well not be him. However, his name regularly appeared in the sporting pages of the 1840s and early 1850s with a career that seems to have started, although is not reported at the time, around 1839 and carried on until at least 1853. Pedestrianism had developed in the 18th century – initially it seems as walking but one branch had evolved into professional running where the competitors offered challenges to one another over particular distances, sometimes with a handicap. The amounts raced for were considerable – £20 in 1850, at current prices, this is worth in the region of £64,000, although much of the money would probably have been made by the wealthy backers of the pedestrians, rather than the athletes themselves. The athletes themselves will have earned a fraction of the sums staked, and, without modern methods of training, shoes, clothing and physiotherapy it was probably a precarious occupation. The pedestrians all seemed to have nicknames. The first that is heard of Cook was in early 1843 whether another runner, Maxwell, forfeited his initial stake to the ‘Greenwich Cowboy’, presumably being unable to run (1). The early reports were all notices of races rather than reports – he was meant to race Blackheath’s Gazeley over 10 miles from Dartford to Blackheath in April 1843 for 10 Sovereigns, but had to forfeit (2). In June 1843 he had his first press report, a victory over Peter Murphy, over 10 miles from the (Old) Tiger’s Head at Lee, over a mile course on the main road – seemingly from Lee Green to around what is now Eltham Green along Eltham Road – winning comfortably. Oddly his opponent had two names, depending on the report ‘Temperance’s Romani’ (3) or ‘Manchester Pet’ (4). During 1844 he was challenged, amongst others, by Richard Manks, the ‘Warwickshire Antelope’, over distances of 1 mile or more for 5 – 25 sovereigns in July 1844 (5). He beat Ned Wilde (Merrylegs) ‘with great ease’ for 10 sovereigns after being given a 40 seconds at the Rosemary Branch in Peckham (6). 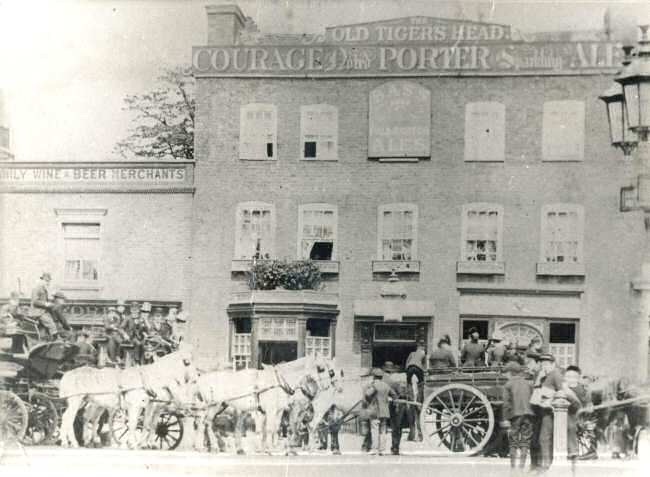 The Rosemary Branch was a pub, which stayed open until 1971, and, like the Tiger’s Head at Lee Green promoted a wide variety of sports – more on that in the blog another day. 1845 saw bigger stakes – beating James Openshaw of Bury for £25 over both 4 and 10 miles, presumably in the same race; (7) there was heavy betting on the race in front of a large crowd at the Rosemary Branch (8). While his career continued, there are fewer reports, 1846 saw his first reported defeat – over 2 miles at Lee Green to James Byron – losing by nearly 100 yards (9). He was challenged over 2 miles by a Lewisham runner, ‘Pirrian’s Novice’, over a mile in 1848 (10) and beat a runner called Dawkins over 2 miles at Smitham Bottom in Purley in 1849 – being described as ‘the old boy’(11). 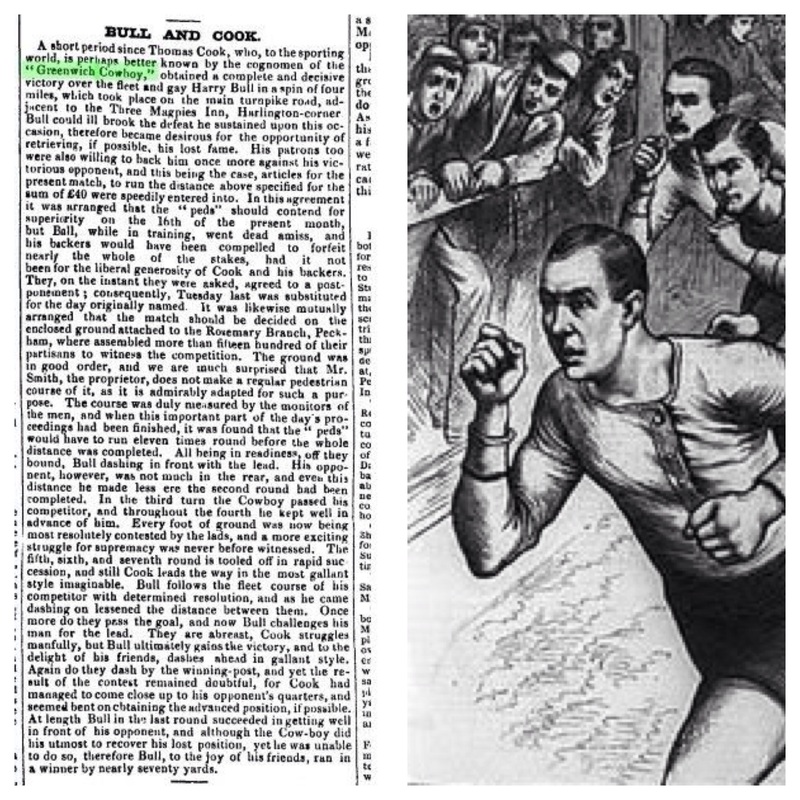 His last known race of what seems to have been a career spanning around 15 years was a failed attempt to run 20 miles in 2 hours in early August 1853 – he completed the first 5 miles in 28 minutes, but it appears he had gone off too quickly as while he was recorded at 59:07 for 10 miles he was slowing down and got into difficulties quite soon after and gave up during the 12th mile (15). With the advantage of modern training methods and kit, only 81 British runners ran under 2 hours for 20 miles in 2014, and the time at 10 miles was only bettered by 350 in 2014. As the identity of Cook is uncertain, we cannot be sure what happened to him after his athletic career was over. If, and it is a big ‘if’, he was the Thomas Cook from the 1851 census, he lived at 8 Enderby Cottages in East Greenwich and was listed as a ‘watchman.’ If it was him, he was having to take a second job to make ends meet as his career waned. That Cook was married to Jemima who was originally from Gravesend, just down the river in Kent. There is no record of either of them after 1851. According to the excellent Greenwich Peninsula History site, Enderby Cottages were at the end of Blackwall Lane, and had been built for rope makers at the Enderby Works; one of the other occupants of number 8 was indeed a ropemaker. The Era (London, England), Sunday, February 5, 1843; Issue 228. The Era (London, England), Sunday, April 9, 1843; Issue 237. The Era (London, England), Sunday, 11 June, 1843; Issue 246. The Era (London, England), Sunday, July 14, 1844; Issue 303. Lloyd’s Weekly London Newspaper (London, England), Sunday, July 6, 1845; Issue 137. Lloyd’s Weekly Newspaper (London, England), Sunday, November 25, 1849; Issue 366. 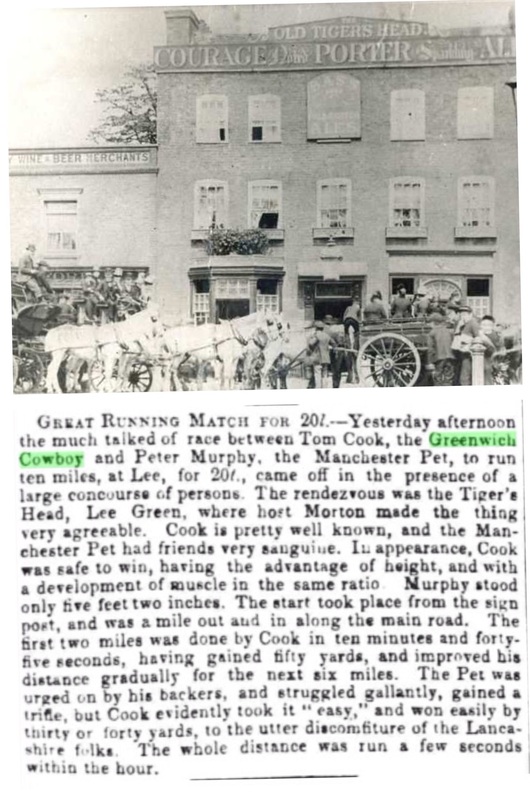 This entry was posted in Greenwich History, Sporting & Aviation Pioneers and tagged Greenwich Cowboy, pedestrianism, Rosemary Branch, Tiger's Head, Tom Cook on July 1, 2015 by Paul B.